A few weeks ago, I tried the new Pepsi Azuki and the Ginger Ale KitKat. You won’t find Pepsi Azuki in store shelves any longer, but Ginger Ale KitKat is still available. I also found a Kinaho Ohagi KitKat (I think the last one?) at a local konbini (convenience store) which I believe was first available in early October, the start of autumn. Pictured on the box above is a traditional Japanese sweet, which is a rice-based cake (mochi) in a ball covered with kinako powder and filled with red beans. Kinako is also known as soybean flour, with a taste like peanut butter. Ohagi are autumn treats made with sweet rice and azuki (red bean) paste. 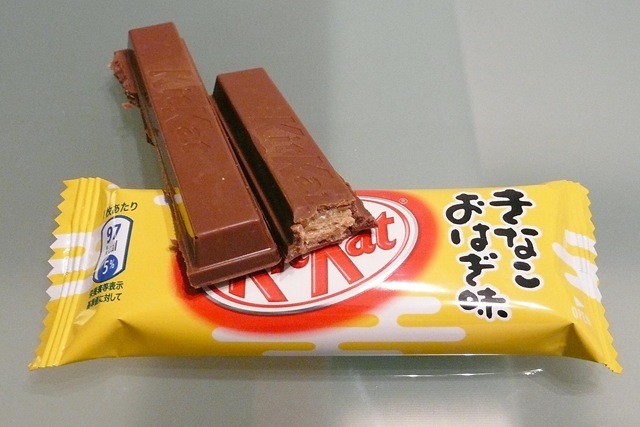 There was only a slight hint of peanut butter and red bean, but I tasted mostly chocolate, like regular KitKat. I guess my taste buds aren’t very fined tuned. Anyway, it was sweet and I liked it, since I like both peanut butter and red bean. If you are really interested in the many different KitKats available in Japan, read Jen Ken’s Kit Kat Blog. Yeah, I had this one before, back when I’d commented about the ginger ale KitKats. I just haven’t had a change to upload my comments to my blog yet (I’ve got about 17 days of backlogged material to get out of the way, to date). It was good, but the artificial sweeteners got in the way of the snack flavor. I still prefer the ginger ale flavor out of the bunch. Earlier today, I stopped at a number of combis (to kill time while I was waiting for a library in Meiji University to open up) and one of them still had a shelf full of Azuki Pepsi. So, it’s not quite completely gone from Tokyo yet. The Metropolis rag has a short article mentioning the flavored KitKats this week. According to them, there are different flavors available only in certain cities. 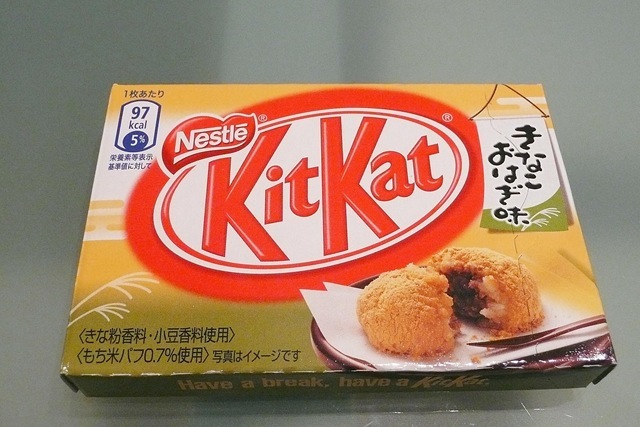 I guess we’re not going to get a shot at the cayenne-flavored KitKats here in Tokyo. I missed the KitKat article in Metropolis (which I do read), but I am sure there are more KitKat flavors on the way. Thanks for commenting. I’ve seen Pepsi Azuki still in stores in both Yokohama and Kamakura. Maybe they’re just selling the remaining stock. I’m waiting for something really good. Actually, I just tried lychee juice last night. It’s like grape juice, but sweeter. I posted about it on my blog. Cayenne KitKat? Ooh, I’d love to try that 🙂 I’m still really enjoying lemon and vinegar KitKat, though. It’s so good! Yes, looks like there are still remaining stock of Pepsi Azuki in some stores if you can it, and I did read your post about lychee juice (see http://jaydeejapan.wordpress.com/2009/11/13/lychee-juice/). Thanks for commenting!